The precision of a straight razor. The ability of a fixed blade. The versatility of a karambit. The resulting knife is fully functional, unique, and stylish. Other features include a full tang 440 stainless steel blade with black finish, thumb grip notches on the spine (aka jimping), and handle scales for added grip. 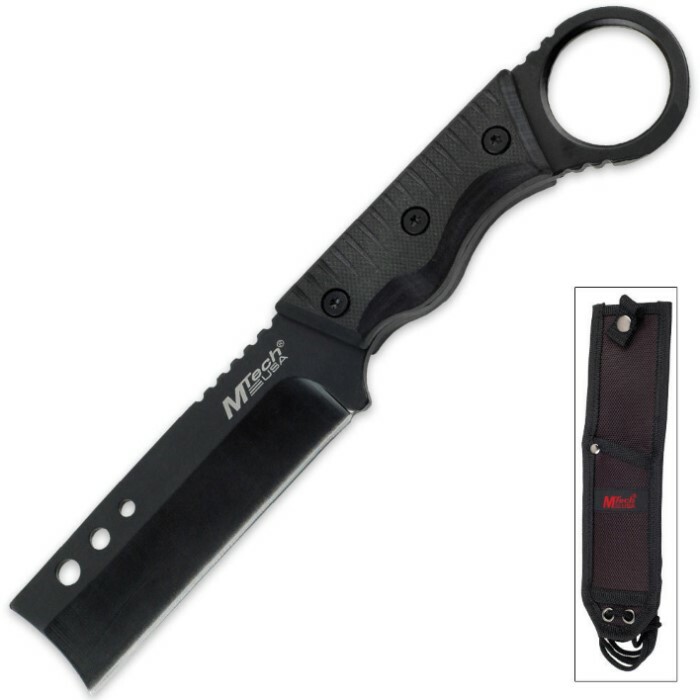 This piece makes an excellent addition to any survival knife collection, bug-out bag, or camping trip. A black nylon sheath is included. 3 1/2 in. blade, 8 in. overall. Got this knife a few months ago and have not been disappointed. Sharpened it some more and I had cut threw battery terminal cable so I'm very satisfied with it. I will get more and when I bought this I couldn't engrave it smh. I don't know what I was expecting with this knife. It's sharp but not razor sharp. Overall a neat little knife. I am disappointed in the clasp that holds the knife in the sheath. It clasps through the ring at the base and it's a little tough to undo smoothly. Definitely not for a quick draw. It arrived very quickly and I'm happy overall with the new addition to my collection. I absolutely love the style. If you are a collector defiantly add one of these bad boys to your collection. Little dull from the box but a quick sharpen makes great performance!! I do not own this knife, so let's get that out of the way right now. I am writing this review because this is NOT a Karambit by any means. Just because the handle has a ring for a finger doesn't make it a Karambit. It looks more like a tactical cleaver, if any thing. I love this knife. Solid and sharp. Small enough to carry but sturdy enough to get the job done. This is my first buy from true swords but defently not my last. Awesome design! Good quality!! Vicious knife!! !